← Another New Teacher Joins the MIY Workshop Team! What Happens When You Have a Good Teacher…. Some of you will know this smiley person, it’s Emma aka Crafty and Cake aka organiser of Brighton’s Dressmaker’s Social events. This is her amazing entry for the Refashioners Get Shirty project that I was part of in August. Gorgeous isn’t it? Read all about how she did it here. I also have some other exciting news to share about Emma….from next week she is going to officially be my “Right Hand Woman” not sure that’s an official job title, but she’s certainly going to be taking on loads of admin and helping me out with lots of other stuff. So, from now on you may be receiving emails and responses to your emails from Emma rather than me. As Emma used to work in events management I think we can say we’re in safe hands! 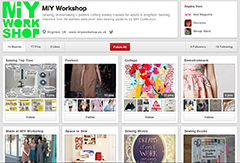 This entry was posted in MIY Workshop and tagged crafty and cake, dressmakers social, learn to sew brighton, MIY Workshop, sewing classes Brighton. Bookmark the permalink. Congratulations to Emma! And congrats to you Wendy for opening up your business to these new people to assist – brave when it’s your business so you need a congrats too!